Not to be confused with Magnolia liliifera. 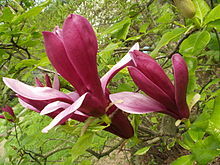 This species is one of the parents of the very popular hybrid Saucer magnolia, M. × soulangeana, the other parent being the Yulan magnolia, M. denudata. ^ "Magnolia liliiflora 'Nigra'". Royal Horticultural Society. 2017. Retrieved 2017-01-23. Wikimedia Commons has media related to Magnolia liliiflora. This page was last edited on 6 March 2019, at 22:26 (UTC).